'Divine Mercy Sunday', the 'Three o'clock prayer', etc. The Chaplet: Use Rosary beads, begin with: Our Father…, Hail Mary…, The Apostles Creed; then on the Our Father bead of each decade, say: "Eternal Father, I offer to you the Body and Blood, Soul and Divinity of Your dearly beloved Son, Our Lord Jesus Christ, in atonement for our sins and those of the whole world." Although not strictly necessary to the Novena, it is recommended that the novena intentions and prayers be prayed with the Chaplet of Divine Mercy (see above) since Our Lord specifically asked for a novena of Chaplets, especially before the Feast of Mercy. Start the Novena on Good Friday and complete it on the Octave of Easter. If possible attend a Divine Mercy Sunday service [services in Holy Family Parish]. In her diary, St. Faustina wrote that Jesus told her, "I desire that Adoration (before The Most Blessed Sacrament) take place (throughout the world), for the intention of imploring Mercy for the world." She also wrote: "On each day of the novena you will bring to My heart a different group of souls and you will immerse them in this ocean of My mercy ... On each day you will beg My Father, on the strength of My passion, for the graces for these souls." DAY 1 (Good Friday) - All mankind, especially sinners. DAY 2 (Holy Saturday) - The souls of priests and religious. DAY 3 (Easter Sunday) - All devout and faithful souls. DAY 4 (Easter Monday) - Those who do not believe in Jesus and those who do not yet know Him. DAY 5 (Easter Tuesday) - The souls of separated brethren. DAY 6 (Easter Wednesday) - The meek and humble souls and the souls of children. DAY 7 (Easter Thursday) - The souls who especially venerate and glorify Jesus' mercy. DAY 8 (Easter Friday) - The souls who are detained in purgatory. "Today bring to Me THE SOULS OF THOSE WHO HAVE SEPARATED THEMSELVES FROM MY CHURCH, and immerse them in the ocean of My mercy. During My bitter Passion they tore at My Body and Heart, that is, My Church. As they return to unity with the Church, My wounds heal and in this way they alleviate My Passion." "Today bring to Me THE MEEK AND HUMBLE SOULS AND THE SOULS OF LITTLE CHILDREN, and immerse them in My mercy. These souls most closely resemble My Heart. They strengthened Me during My bitter agony. I saw them as earthly Angels, who will keep vigil at My altars. I pour out upon them whole torrents of grace. Only the humble soul is capable of receiving My grace. I favour humble souls with My confidence." Most Merciful Jesus, You yourself have said, "Learn from Me for I am meek and humble of heart." Receive into the abode of Your Most Compassionate Heart all meek and humble souls and the souls of little children. These souls send all heaven into ecstasy and they are the heavenly Father’s favourites. They are a sweet-smelling bouquet before the throne of God; God Himself takes delight in their fragrance. These souls have a permanent abode in Your Most Compassionate Heart, O Jesus, and they unceasingly sing out a hymn of love and mercy. "Today bring to Me THE SOULS WHO ESPECIALLY VENERATE AND GLORIFY MY MERCY, and immerse them in My mercy. These souls sorrowed most over my Passion and entered most deeply into My spirit. They are living images of My Compassionate Heart. These souls will shine with a special brightness in the next life. Not one of them will go into the fire of hell. I shall particularly defend each one of them at the hour of death." "Today bring to Me SOULS WHO HAVE BECOME LUKEWARM, and immerse them in the abyss of My mercy. These souls wound My Heart most painfully. My soul suffered the most dreadful loathing in the Garden of Olives because of lukewarm souls. They were the reason I cried out: ‘Father, take this cup away from Me, if it be Your will.’ For them, the last hope of salvation is to run to My mercy." Most compassionate Jesus, You are Compassion Itself. I bring lukewarm souls into the abode of Your Most Compassionate Heart. In this fire of Your pure love, let these tepid souls who, like corpses, filled You with such deep loathing, be once again set aflame. O Most Compassionate Jesus, exercise the omnipotence of Your mercy and draw them into the very ardour of Your love, and bestow upon them the gift of holy love, for nothing is beyond Your power. 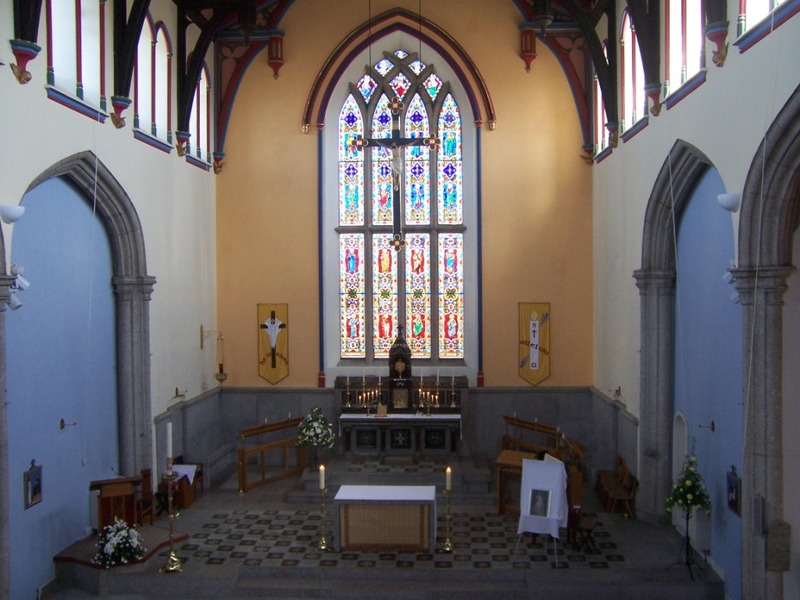 note: "And so with provident pastoral sensitivity and in order to impress deeply on the souls of the faithful these precepts and teachings of the Christian faith, the Supreme Pontiff, John Paul II, moved by the consideration of the Father of Mercy, has willed that the Second Sunday of Easter be dedicated to recalling with special devotion these gifts of grace and gave this Sunday the name, "Divine Mercy Sunday" (Congregation for Divine Worship and the Discipline of the Sacraments, Decree Misericors et miserator, 5 May 2000). 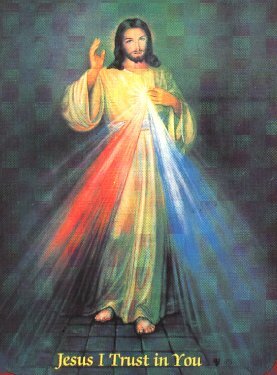 The Feast of Divine Mercy: Sr. Faustina stated according to Jesus' wish was to be celebrated on the first Sunday after Easter (Diary, 49, 88, 280, 299, 420, 570, 699, 742). “Souls perish in spite of My bitter Passion. I am giving them a last hope of salvation; that is, the feast of My Mercy”. … “If they will not adore My mercy, they will perish for all eternity”. This is a day of special grace for us all and particularly a day of deliverance for sinners. “Proclaim that mercy is the greatest attribute of God. All the works of My hands are crowned with mercy.” (diary 301). Whoever approaches the Fount of Mercy on this day...... will be granted complete remission of sins and punishment" (diary 300). “My Heart overflows with great mercy for souls, and especially for poor sinners… It is for them that the Blood and Water flowed from My Heart as from a fount overflowing with mercy. For them I dwell in the tabernacle as King of Mercy” (diary 367). 7th April 2013 Divine Mercy Sunday afternoon prayers. "O Jesus, who filled St. Faustina with profound veneration for Your boundless Mercy, deign, if it be Your holy will, to grant me, through her intercession, the grace for which I fervently pray........ My sins render me unworthy of Your mercy, but be mindful of St. Faustina's spirit of sacrifice and self-denial, and reward her virtue by granting the petition which, with childlike trust, I present to You through her intercession. Our Father...Hail Mary...Glory....." footnote: Many when praying the Chaplet alone say 'me or my' instead of 'us or our'. The following interesting comment was found in 2012 on another DM source: "When we pray, "in atonement for OUR sins", we are not just praying for our own personal sins, if it was just that, then the prayer would be, "in atonement for MY sins"... It is our whole family tree we are including, our family lineage, not only our immediate family but our whole family past and present. In the Bible the family tree is the whole lineage, those who have gone before, back to the beginning of time, and those who come after, till the end of time." ... " In Deuteronomy 7:9 Our Lord said, to those who pray and honour my commandments I will give credit to a hundred generations. Jesus also gave us the opportunity to atone for others on the feast of Mercy, for it is not only a great opportunity to cleanse our own souls but we can also do a lot for others souls on that day (Diary 206)"